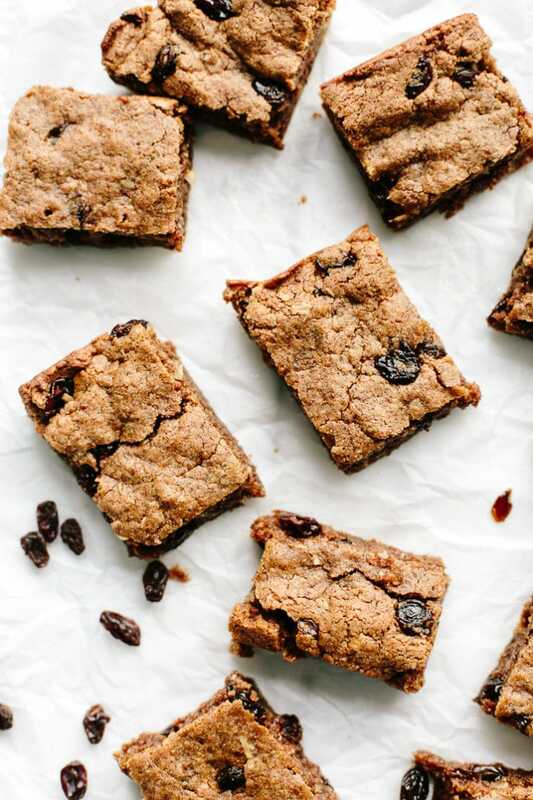 These vegan and gluten-free oatmeal raisin cookie bars are gooey, dense, and sink-your-teeth-in delicious. And that sweet cinnamon-raisin touch makes them feel almost breakfast appropriate. Almost. Mmmhmm, you got it. 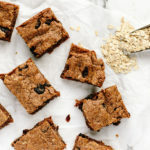 x = oatmeal-raisin cookie bars. 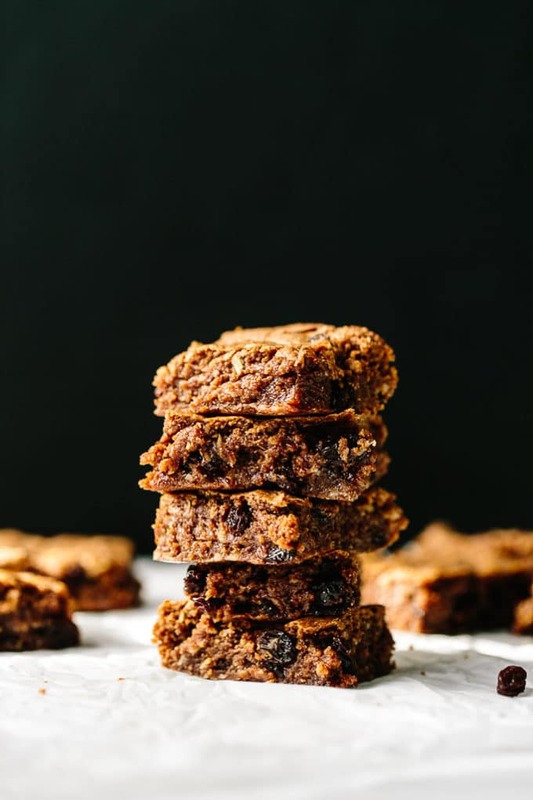 These bars are made with the same delectable cookie base as those beloved chocolate chip cookie bars, only they’re outfitted in a new wardrobe of cinnamon and raisins. Sweet and spiced and everrrrything nice. 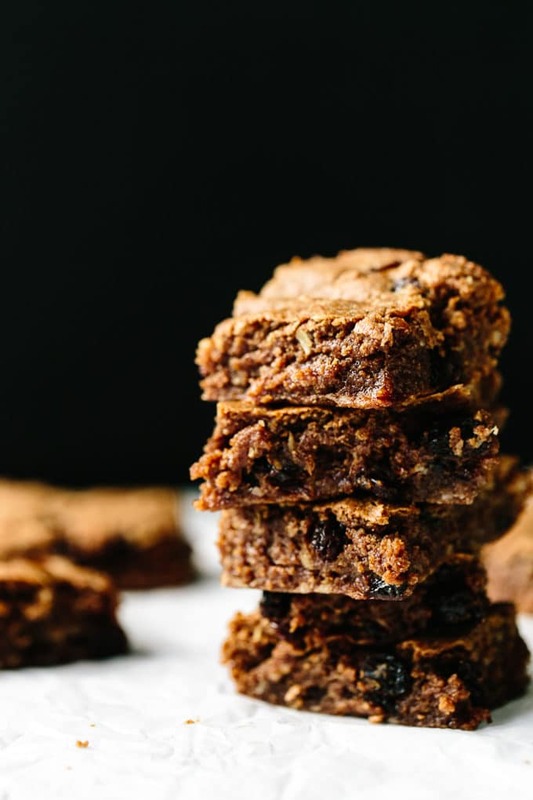 They’re just as gooey, dense, and sink-your-teeth-in delicious as their chocolaty predecessors, and that sweet cinnamon-raisin touch makes them feel almost breakfast appropriate. “Almost” as in I had one for breakfast yesterday. And “almost” as in I’m predicting I probably had one for breakfast this morning too, only I’m not 100% certain because I wrote this post yesterday. Fingers crossed that my current self is as fancy free as my former self because if she is, my Monday is off to a good start. Because that gooey stack of deliciousness colliding with a Monday can only mean good things. These bars require just 10 ingredients — pinch of salt and cinnamon included — and 10 minutes of prep + 25 minutes of baking. 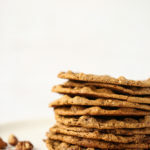 To make them, you’ll start by creaming together natural almond butter, coconut sugar, and pure vanilla extract for a full minute (go on and time it — I certainly do). Then, you’ll whisk together oat flour, rolled oats, baking powder, cinnamon, and sea salt until well combined. Add the oat flour mixture to the creamed almond butter mixture, and before you start beating, pour in a bit of unsweetened almond milk. Then, turn your mixer on and beat until combined. Add in a generous scoop of raisins and beat again until the cookie dough is dotted with those wrinkled gems. Scoop the dough into a lined 8×8 baking pan (double-check that your pan is 8×8 because 9×9 will negatively affect the texture and moisture of the bars), and bake until crisp and chewy on the outside and tender and gooey on the inside. Easy as pie cookie bars. 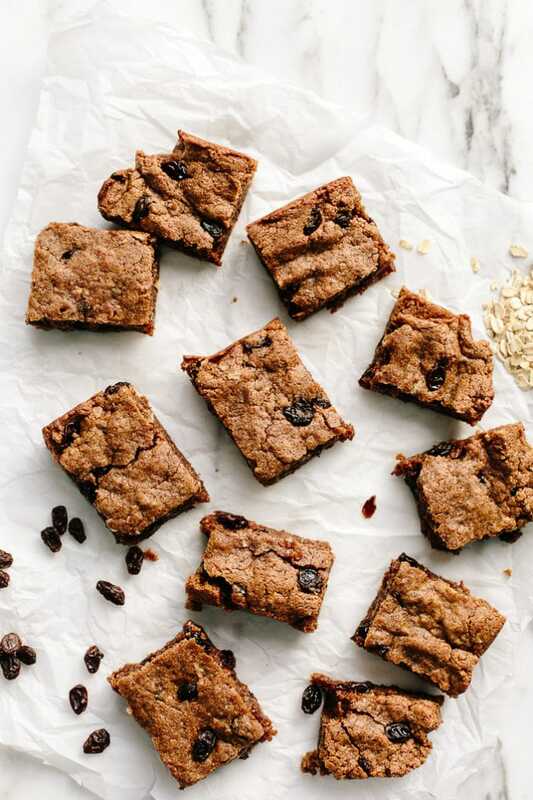 These gooey vegan and gluten-free oatmeal raisin cookie bars require just 10 ingredients—pinch of sea salt and cinnamon included—and 10 minutes of prep + 25 minutes of baking. 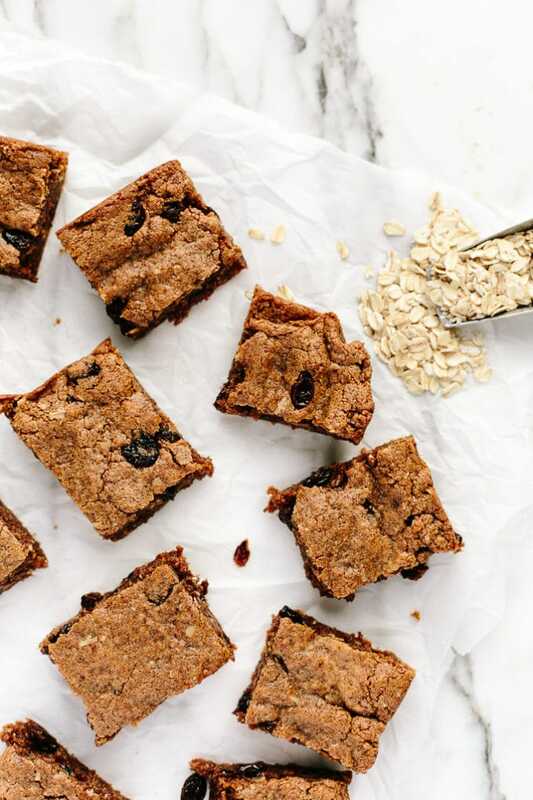 They're packed with fiber-rich rolled oats, sweet and chewy raisin, and nutty almond butter. Preheat oven to 350F. 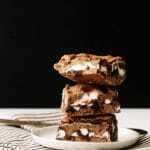 Line an 8x8-inch square pan with parchment paper (check your pan size, because 9x9-inch won’t work for this recipe). In a large mixing bowl, cream together the coconut sugar, almond butter, and vanilla on high for 1 minute using a stand mixer with paddle attachment. It should pull together into large mounds as it moves around the mixing bowl. Meanwhile, in a small mixing bowl, whisk together the oat flour, rolled oats, baking powder, cinnamon, and sea salt. Place the bowl next to the mixer. With the mixer off, add the oat flour mixture. Then, pour the almond milk over the oat mixture and begin beating on low and increase speed to medium. Beat for 15 seconds or until just incorporated. The dough should pull together into large, moist mounds as it moves around the mixing bowl. 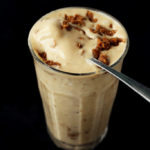 If the dough is dry and broken into small crumbles, add more almond milk, 1 tablespoon at a time, and beat until it pulls together until large moist mounds within the mixing bowl. Add the raisins and briefly beat to incorporate. Transfer the dough to the lined pan and use your fingers to press evenly into the bottom and outwards until it’s nearly touching the sides of the pan. Bake for 25 to 28 minutes or until the edges are golden and crackled and a toothpick inserted into the center comes out mostly clean with a bit of moist crumb at the tip. Don’t overbake. Let cool completely in pan. Grasp the edges of the parchment to gently remove the bar from the pan. Slice into 12 to 16 bars. *You can probably tell from the pictures, but these bars aren't exceptionally oat-y in terms of the amount of whole, old-fashioned rolled oats they contain. 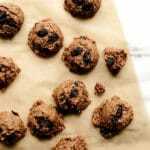 If you want more of an oatmeal-raisin cookie texture, increase the rolled oats to 1/3 cup or 1/2 cup. OMG, YUM! My sibs have always thought I was weird for loving oatmeal raisin cookies but I do! These are so for me! What?! Well, then we can be weird together, because oatmeal raisin cookies are one of my favorites. I’m actually a bit ashamed that this is my first oatmeal-raisin combo on here, but better late than never I suppose. 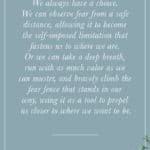 Hope your week is off to a great start, Tori! 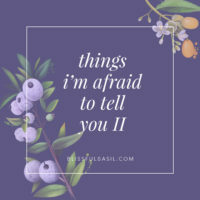 I just saw you share these on Instagram and I HAD to click over to see more! They look fabulous! And just last week I bought coconut sugar (for the first time! ), now I’ve got to give these a try. I have been craving some homemade cookies. These look yummy! I love that you used staple ingredients. 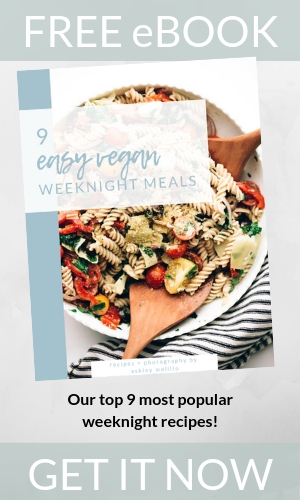 Oh wow these look delicious — and super easy! Going to try making them this week:) Thanks for posting! Oatmeal raisin in the perfect classic combo! 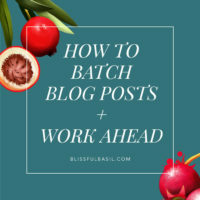 Pinning to share, and looking forward to trying these soon. Thank you! Where do o I find coconut sugar and natural almond butter at? Hi, Kat! It really depends on where you live and the type of grocery stores you have access to, but I usually get both almond butter and coconut sugar at Trader Joe’s or Whole Foods. 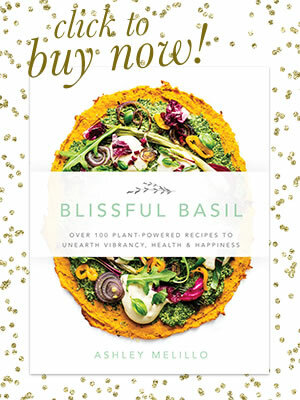 However, most general grocery stores will have both too (or at least almond butter). I hope this helps! These looks delicious! 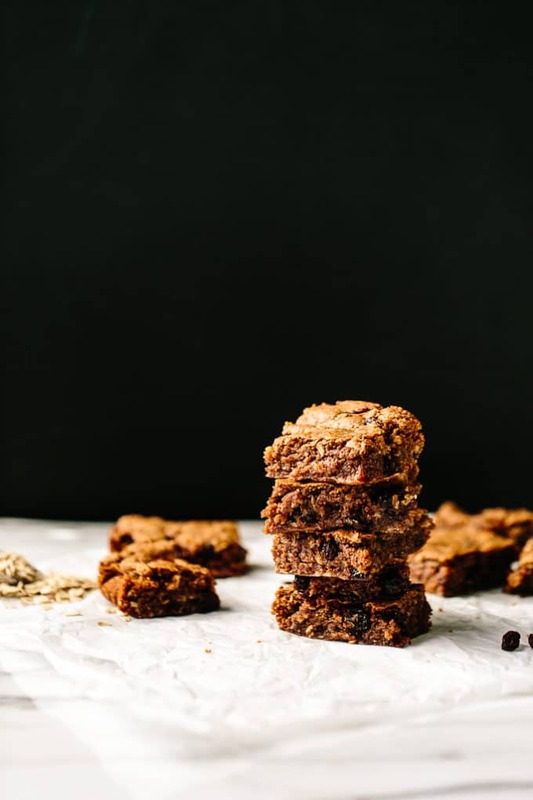 I’ve been oddly craving oatmeal-raisin something lately (for whatever reason, idk) and this recipe would fit the bill perfectly! 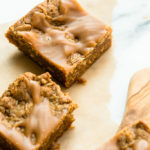 Can I make these into cookies instead of bars? Hi, Dana! I haven’t tested them that way, so I can’t say for certain. 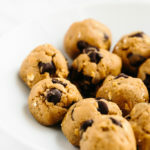 That said, because of the nut butter, the dough is much softer than traditional cookie dough so if you make cookies they may spread considerably while baking. I’d stick to bars if you can. Enjoy! So glad you’re enjoying them, Allison! Thanks for taking the time to come back and share your thoughts and rating—means so much.